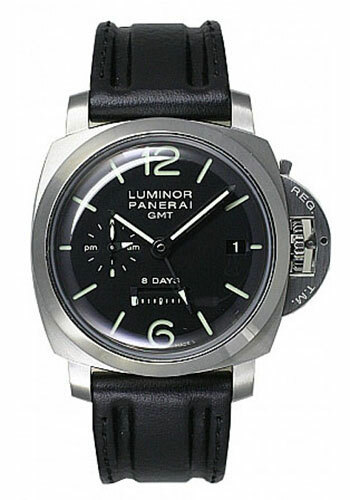 44mm AISI 316L brushed steel case, see-through sapphire crystal back, polished bezel, brushed steel device protecting the left-handed crown, black dial with luminous Arabic numerals and hour markers, date at 3 o’clock, seconds and 24h indicator at 9 o’clock, linear power reserve indicator at 6 o’clock, hand-wound Panerai P.2002 calibre movement with hours, minutes, small seconds, date, second time zone, 24h indicator, linear power reserve indicator, seconds reset, approximately 8 days of power reserve, black calfskin strap. Water resistant to 100 meters. 44mm 18K brushed pink gold case, see-through sapphire crystal back, polished bezel, brushed pink gold device protecting the left-handed crown, brown dial with luminous Arabic numerals and hour markers, date at 3 o’clock, seconds and 24h indicator at 9 o’clock, linear power reserve indicator at 6 o’clock, hand-wound Panerai P.2002 calibre movement with hours, minutes, small seconds, date, second time zone, 24h indicator, linear power reserve indicator, seconds reset, approximately 8 days of power reserve, brown alligator strap. Water resistant to 100 meters. 44 mm 18K polished red gold case, 6.6 mm thick, sapphire back, 18K brushed red gold crown, polished red gold bezel wirh composed of gold, copper and other metals, sapphire crystal formed of corundum, brown dial with luminous arabic numerals and hour markers, date at 3 o’clock, seconds and 24h indicator at 9 o’clock, linear power reserve indicator at 6 o’clock, calibre p.2002 manual winding movement with hours, minutes, small seconds, date, gmt, 24h indicator, power reserve indicator, seconds reset, approximately 8 days of power reserve, dark brown alligator strap. Water resistant to 5 bar.